Image 1 of 9: Spacious one bedroom apartment with balcony and sea views. 2 of 9: Comfortable bedroom with kingsize bed and cable TV. 3 of 9: Enjoy the view and sea breeze from the Balcony. 4 of 9: Dining area and TV. 5 of 9: Sea view from the Living Room. 6 of 9: Watch TV from bed. 7 of 9: Fabulous sea view from your bed. 8 of 9: Fully-equipped kitchen. 9 of 9: Bathroom with shower. Apartment 1-5A is a luxurious and elegantly furnished one bedroom, one bathroom air-conditioned apartment in Block 1 of Turtle Beach Towers, a four-tower gated apartment complex. There is a spacious living and dining room as well as its own kitchen. In addition to the gorgeous white sand beach, which is a mere stone's throw away, guests have free access to the large swimming pool on the complex. Apartment 1-5A is located in the North-West corner on the fifth floor of Block 1, which is the building closest to the Caribbean Sea. Beautiful sea views from spacious, beautifully decorated Living and Dining Room. Air-conditioned. Dining for two on the balcony with great views. Living room equipped with cable television, DVD player. Two sofas which may be used as beds. King bed and bathroom en suite with shower. Cleaning service by housekeeper every other day. 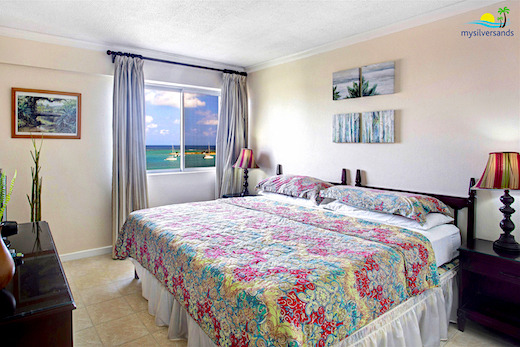 1 - 5A, Turtle Beach Towers, Ocho Rios costs from $105.00 to $120.00 per night. Rates are for two persons. An additional person may occupy the unit with a surcharge.